When people ask me how my “new job” with Strong Women, Strong Girls is going, I tell them that almost nothing has changed! I was the FAO Schwarz Fellow for 2014-2016 at Strong Women, Strong Girls (SWSG) in Boston, and officially ended my fellowship in June 2016. The previous fall, conversations with my supervisors began about what it would be like for me to stay on in a long-term staff role following the end of my fellowship. Eventually, things became official, and in June, I became a Program Manager with SWSG. In this role, I continue with the same responsibilities that I had during the second year of my fellowship: Managing partnership with SWSG’s college- and university-based chapters, elementary schools, and community centers; leading SWSG’s Junior Mentor Program; coordinating relationships with peer organizations; contributing to our research project on girls’ experiences with mental health and body image; and supporting mentor training, special events, and Development. All in all, the transition was very natural. Fortuitously, the transition happened to coincide with my three-week vacation to Colombia. I left Boston as an FAO Fellow, and returned as a Program Manager. It was the longest vacation I had taken since beginning my fellowship, and allowed me valuable time to reflect on my experience with SWSG thus far and my intentions going forward. There is nothing like explaining your job in Spanish in a completely different cultural setting to help you pause and reflect! There are two significant differences that I would note between my pre- and post-fellowship experiences: A greater sense of confidence and security and deeper consideration of my next career steps. As a fellow, I was constantly taking on new projects and roles as I shifted from a Development- and adult volunteer-focused role in my first year, to a program management-focused position in my second year. I was always the “new person,” and always learning. Now as a Program Manager, I am certainly still learning; however, I have the familiarity and trust of established relationships in the community, greater certainty in my skills, and greater efficiency. I continue to be challenged by staff transitions and the growth of SWSG initiatives; yet, it takes me less time to get up-to-speed. In terms of my perspective on next steps, the offer from SWSG to stay on as a Program Manager really forced me to consider and re-consider my aspirations. Before a staff departure started the conversation about me staying on, I had envisioned graduate school being my destination post-fellowship. Since undergrad, I’ve been interested in pursuing a Masters in Social Work, but decided to get some work experience before going back to school. Both while at SWSG and in my previous job, my supervisors have primarily been social workers, and I have really enjoyed learning from their approach. When I was offered the Program Manager role, I reasoned that some additional, deeper exposure at SWSG would only help me strengthen my future academic experience. Plus, I could save more money to have while in school (and living off loans! ), and put me on track to get an even better job after completing my Master’s degree. Now, in my third year with SWSG, the question I am considering is simply when—and where—to go back to school, and what kind of Social Work, Education, and/or Nonprofit Leadership program is the best fit for me. Working at Strong Women, Strong Girls has been an absolutely unexpected blessing, challenge, growth opportunity, and true joy in my life, and I am proud to be working here for a third year. 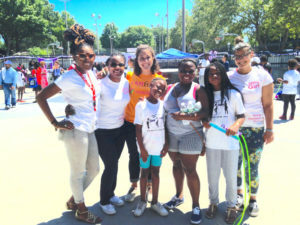 Here I am (in the orange t-shirt) with SWSG staff and a family that is part of our Junior Mentor program at Jump into Peace, an event in August 2016 organized by the office of Boston City Councilor-at-Large Ayanna Presley to promote peace and girlhood. 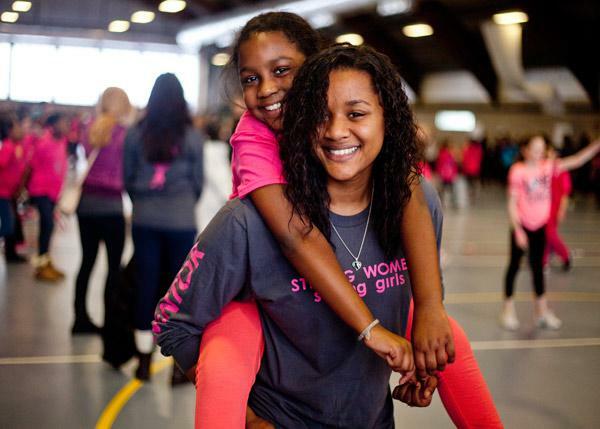 Sarah Kacevich is the Program Manager for Strong Women, Strong Girls (SWSG) in Boston, an organization that empowers girls to imagine a broader future through a curriculum grounded in female role models and delivered by college women, who are themselves mentored by professional women. Outside of work, she loves to hike, run, do yoga, make art, cook, and travel. She is a Class of ’16 FAO Schwarz Alumni Fellow.